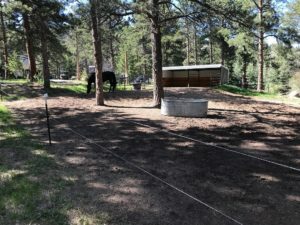 Green grass is here, but how do we keep our horses from overgrazing every blade in the first month and turning our property into a dirt lot? There is hope! A few years ago I read an article about a Texas A & M military reenactment group who were using a track system at their five acre base to keep their horses fit for their weekend duties. Forward to a couple years ago when we moved to our new property. It was a blank slate with no fencing or any horse amenities. 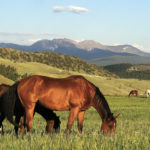 We requested an evaluation from Colorado State University Extension Agent Jennifer Cook, who is a grasses and grazing specialist, to come over to look at the natural state of our property and to advise us on how to best steward and preserve our land while the horses also enjoyed the property. One of her suggestions was a track system. There are certainly exceptions, but in general, the arid Colorado climate flora cannot sustain continuous grazing. So how do we keep the horses happy, healthy and living the way they were designed to live which is walking and grazing throughout the day? The track system! 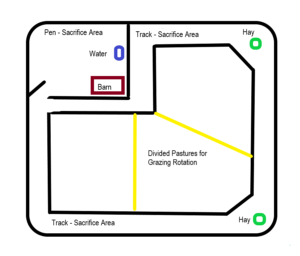 The principle behind the track system is to sacrifice smaller areas in order to save larger areas while keeping the horses moving and grazing. The track system can work on most any size of property. In our case, we designated one pen with the water and shelter that the horses have access to all day, and we shut them in there at night for our own peace of mind and so we are more likely to hear them if anything is amiss. The back gate from the pen opens to the track, which is a 12’ wide thoroughfare that makes a circle perimeter around about 6 acres. We also created two other wide areas along the track for feeding hay. The recommended track width is 6’ to 12’ wide. The narrower width will keep them moving more, but wider will provide more escape routes from dominant horses. We have three horses on our track and the 12’ width seems to give horses that know each other plenty of room to negotiate. In the morning, we put hay out in the two larger areas and open the gate to the track. The horses spend their day walking the track to the hay and coming back to the water. This time of year there is a little grass that comes up on the track, but the track and the pen are essentially sacrifice areas where the traffic is too heavy to grow much vegetation. The area in the middle of the track we have divided into three pastures that we use to rotate the horses through for an hour or two each day. That time decreases or may even cease if the grass heights get too low, but they still have the track to keep them walking and busy. Ideally, we would have slow feed hay nets around larger hay bales in the feeding areas, but that does not work where we are with the elk and deer. 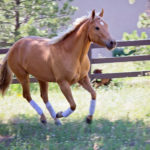 We have noticed an increased level in the fitness of the horses and are amazed at how they walk the track most of the day, sometimes “doing the loop” at a gallop just for fun. 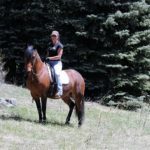 It is a great way to keep your horses fit if you don’t get to ride as much as you would like. You will find they move a lot more then they do in an open pasture. Materials are flexible. We have seen more permanent tracks or just electric fencing. 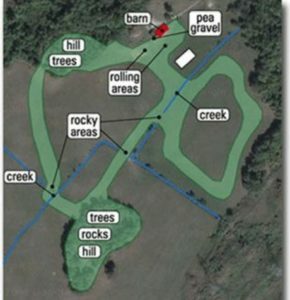 We chose cord electric fencing and T-Posts with caps over the majority of the track to try it out. We picked cord over tape because it does not catch the wind and snow like the tape. 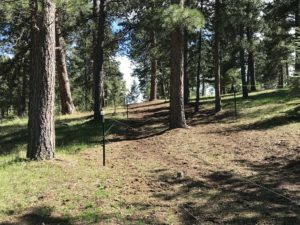 Starting with the “temporary” fencing gives you the flexibility to change the width and maybe the route. The track system can work in all different climates and for different purposes. If the majority of your land is used for arenas or barns, the track system can be a great way to use those smaller spaces and corridors for exercise and turnouts. We have utilized our track system for over two years now and it has been revolutionary for our horse keeping and land management. Track area made from cord electric fencing, note green grass on either side.